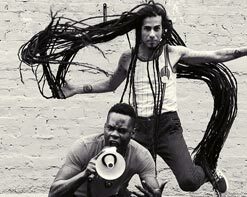 Originating from London, England, Elephant 12 is known for their highly energetic performances. The act is a combination of quirky fusion and unapologetic punk rock laced with powerful electro bass lines. Elephant 12 is remarkable on stage. They are renowned for their sing along anthems, catchy arrangements, and lyrics of love, reality and heartfelt emotion. For a taste, we are attaching the video “Holiday” which combines slick graphics and live action.Visually, “Holiday” is a mix of live action treated to play between a comic book and a video game. This video is filled with lights , colors and a club vibe that takes the viewer for a ride through the vibrant night life. This shows Elephant 12 knows a thing or two about having a good time! E 12 has already been generating the buzz. The band has been praised by legendary Canadian broadcaster Alan Cross and The BBC. Elephant 12 brings a gravitating energy that hypnotizes the audience and has them transfixed on the performance from beginning to end.They have been applauded by Afropunk, The Vinyl District, Fred Perry SubCulture and more, and have performed everywhere from London, NYC, Austin , Texas to Toronto and even South By South West. We’re very excited to be working with our new friends across the Atlantic! Elephant 12 is a tremendous act and we can’t wait for you to check out their new video “Holiday.” Please contact Andy Gesner and the HIP Video Promo crew at (732)-613-1779 or email us at info@HIPVideoPromo.com for more info on Elephant 12.